After the country this year achieved its best Eurovision result ever, the national broadcaster is now preparing for the 2019 selection. The Czech fans are feeling the attitude towards the contest changing for the better. In autumn 2017, Czech national broadcaster Česká televize started a new online national final called ESCZ. 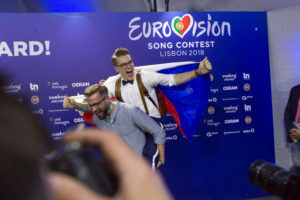 From the “televoting” made from the votes sent by Czech people through the official Eurovision App and the international jury voting, Mikolas Josef was chosen as a clear winner. Then his fame became bigger and bigger until the whole Eurovision Song Contest 2018 in Lisbon, where he ended on a 6th place in the final. That is the best Czech result up to date. We cannot be surprised that the broadcaster now sticks to this formula and keep the same format only with minor changes. The rules stayed the same as last year – aside from the usual Eurovision rules with a maximum of six on stage, length up to three minutes and not being publicly released before 1st September, Česká televize also wants the composers to submit a song with a Czech singer or lead vocalist. The submission period was open from the 31st August until 31st October and approximately 300 songs were received. That is the same number as last year, but the positive fact about this is that it included about 60 songs written by Czech composers. That is a double compared to 30 domestic-based entries for 2018. This shows that Czech producers and composers or the artists themselves are beginning to accept Eurovision Song Contest as a mean to promote their work and themselves instead of some kind of freak-show or a circus as Czech media usually entitle the Eurovision Song Contest. For the fans, this is a big improvement which will help them in their future work with spreading the joy. The broadcaster is now internally listening to all the entries, and the outcome will be a set of 6 or 8 songs that will take part in the online national final. In 2018, there were six participants, but now the broadcaster asked on its official Facebook profile if people think there will be 6 or 8 finalists this year, hinting that 8 is a possibility. Czech fans probably want to see and hear as much of the songs from the selection as possible, because the poll ended with 76 % for 8 songs and 24 % for 6 songs. Out of the 174 voters, this is approximately 132 people for the higher number of the participants. But we still have time until early January 2019 until we know the lucky finalists. Then the songs will be available in the Eurovision app for people to vote. And here comes the other change from the 2018 edition. In 2019, also foreign fans will be involved. They may vote in the app as well as the Czech voters. Their votes will be counted to one set of votes which will be another international juror along some previous Eurovision participants. We still have some time to discover who will follow the steps of Mikolas Josef. The Czech Republic debuted in 2007 and waited 10 years and 7 participation until reaching the prestigious TOP 10 in the grand final. 6th place is the spot where the Czech Republic landed after nerve-wracking results in Lisbon. In the video below, remind yourself of Mikolas’ Lie To Me. This is a a performance from Eurovision In Concert in Amsterdam, the Netherlands.